Urban Fantasy is not my favorite genre, but I am convinced C.T. Phipps can do no wrong. And when you add Michael Suttkus to the mix hilarity is sure to ensue. This is the second installment of the Bright Falls Mysteries and if anything it is even better than the first. Although the mystery in this one wasn’t that difficult to figure out. Here is the Blurb. Life is not easy for the world’s first weredeer detective. A simple hike turns into a media circus when Jane Doe, her best friend Emma, and a pair of monster hunters find a mass grave. Determined to find the parties responsible, Jane soon discovers a sinister cult leader has decided to make Bright Falls, Michigan the home of his corrupt religion. As if this wasn’t complicating her life enough, Jane also has to decide whether or not she wants to begin a relationship with FBI Special Agent Alex Timmons or local crime lord Lucien Lyons. Both men are determined to get to the bottom of the crime she’s investigating but may be distracted by their own agendas–as well as their love for Jane. So why was it better than the first book? Well the main reason is there was much less introspection. The story is told from the POV of Jane Doe and in the first book she kind of got lost in thought and would get side tracked. It was a good way to explain to the reader things about the world and it was done well, but did tend to ramble. In this book Jane has Raguel in her head to keep her on track. Who is Raguel? That is an easy question with a hard answer. Raguel, also called the Merlin gun is an angel that was turned into a sentient gun. There are a few other new characters Like Kim Su and Robyn, but don’t worry all the old favorites are back. There is the adorable and ever cheerful Emma. And then there is the……. Alex. 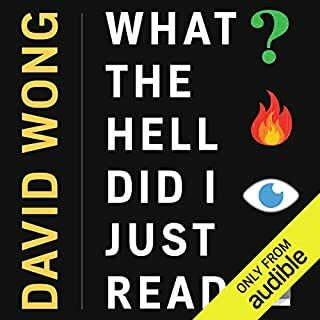 I was given a copy of the audiobook by the author in exchange for an honest review. 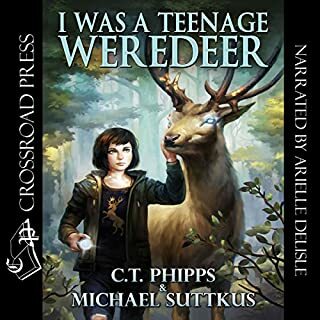 The Audiobook was narrated by Arielle DeLisle and she did an excellent job. She has the perfect voice for Jane and really brings her to life. It is a fast paced romp that is not afraid to laugh at itself or anyone else. It is filled with strange yet wonderful characters. The dialog is witty with plenty of snark and the story itself will pull you in. And don’t forget the puns! 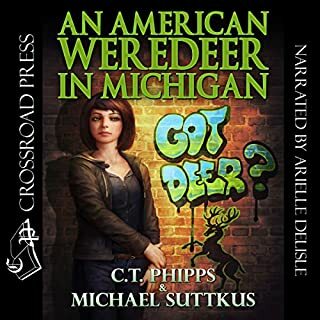 Overall An American Weredeer in Michigan is an excellent sequel and I am setting my sights on book three. I give An American Weredeer in Michigan 5 stars. "Bigfoot is real." That's what primatologist Dr. Sarah Bishop's father told her before his academic disgrace and untimely death. Now, Sarah is eager to restore her father's good name. Survival show host Russ Cloud is just as eager to boost his plummeting ratings. They'll both have a shot at redemption when they find themselves hired by eccentric billionaire Cameron Carson. After a series of his publicity stunts end in spectacular failure, Carson has a plan to redeem his tarnished image: capture a live Sasquatch. It is full of Humor, terror, bigfootses? bigfeet? and ofcourse zombies. What more could a person want? 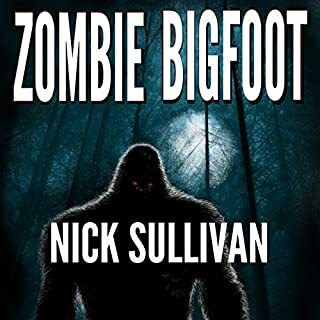 There is a reason that Nick Sullivan	has narrated hundreds of books. I will let you guess what that is. Actually no I wont. It is because he does a great job! This being his own book made the reading even better. The real surprise was the reading of the Journal. That part was especially well written. 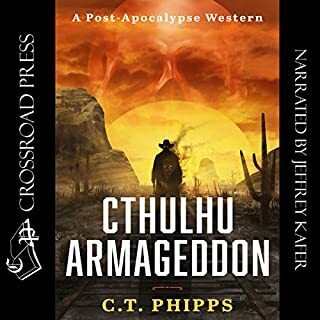 I was given a free copy of this Audiobook in exchange for an honest review. That in no way alters my opinions.My really cool review with graphics and stuff is on my blog. thebloggoblin dot com But I really do highly recommend this one to any that like to laugh and/or zombies. That just made me think wouldent a giggling zombie be terrifying? first came across Jacob Cooper back in August of 2015. 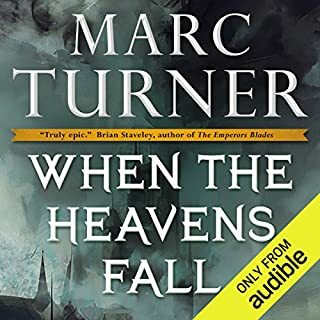 I had a job that I could listen to books most of the day, so I went through audio books fast. For that reason I was searching Audible one morning before I went to work for something new, I only had 2 requirements. First that it was read by someone I liked already. And second that it was long. When I search for a new book I usually do a search of my favorite narrators first. I searched Luke Daniels and didn’t see anything new. Then Michael Kramer and what do you know, I saw Circle of Reign a bit over 20 hours long. I was in a hurry so i didn’t even read the description, I just started downloading it to my phone and left for work. I know what you’re saying right now. You are saying “How the hell can he remember doing a search for a book over a year ago?” Well I have a pretty good memory when it comes to what happens in books. But not names, if I ever meet you in person save us both some awkwardness and tell me your name at least 10 times over the next hour or two. I am almost as bad with book titles and even worse with Song titles. But if we had met at a book store and we walked down the aisles I can point to every book I have read and give a synopses of what it’s about. That is a lot of books, but let’s get back to the one I am reviewing, whatever it’s called. I usually start my reviews with the Physical aspects of a book. But we need to go about this one differently. See this book Is not the same one I downloaded over a year ago. Well that’s not actually true. Since I first listened to it till now it has undergone a lot of changes. No I don’t mean like puberty. 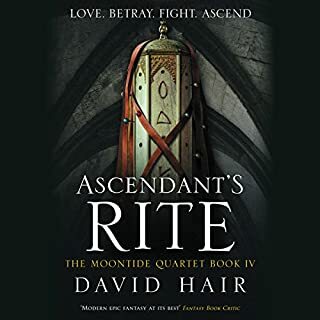 Jacob was approached by a guy you might have heard of named David Farland and if you don’t recognize him from his Runelords Series, you might know some of the people he taught while a English professor like Brandon Sanderson, Brandon Mull, James Dashner, and Stephanie Meyer. (You shouldn’t hold that last one against him.) David had read CoR and enjoyed it but thought this self published first time author could make it even better with some coaching. So together they cut about 35,000 words and then added around 70,000. The result is not really a new book but I will admit a better one. Now let’s get to the Physical part. The cover is pretty cool and shows a part out of the book well. But it is not very eye catching. I listened to the audio book again excellently narrated by Kramer. And while the first version was a nice long AB this version is even longer at 24 hours 37 min. One of the things I love the most about this book is the action POVs Like in the graphic below there are 3 people 2 fighting and one watching. Well you as the reader are not bound to one POV you are bound to the action. During this fight you will see out of each one’s eyes and here their thoughts. It is so cinematic you can’t help but picture a movie in your head as you read. I wouldn’t actually classify this series as Grimdark, but it is a near thing. The only reason holding it back is no one really knows how screwed they are. The main character is Reign A Wood dweller of the Western Provence known as Arlethia. What is a Wood dweller? Well they are not long lived like elves but they do have the ability to sense vibrations of anything moving close to them through the tree roots and are blessed with an almost super hero level speed . A few things didn’t really fit smoothly for me but they will probably be resolved in book two. There is quite a bit of in world language used that did get a bit confusing at times but not enough I didn’t know what they were talking about. I loved the original and rated it 4.5 stars. This one was even better and it gets a full 5 stars out of 5. Keep reading to find out more about the giveaway. This story is about Sacrifice at its heart. What about Michael Kramer’s performance did you like? The scene of a guy retrieving the pearl! Oh my god that guy is my favorite fisherman ever! I usually take notes while I read or listen to a book that I plan on reviewing. I didn’t with this one not because I didn’t like it. No I was so engrossed in the story I completely forgot. Actually that’s a lie I did write one note and for the first and only time I will post my unedited notes in a review. Well that’s a lie too, I am a bad speller so that has been fixed But you know what I mean. 11 hours and 37 min later all I can say is wow good book sleep now. After 12 hours of sleep I might be able to articulate that sentiment better. ……Wow Great book? No I can do better….. It was excellent I loved getting to know Thannuel more. 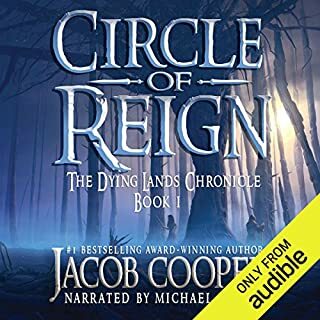 He is such a awesome character and he was hardly in Circle of Reign (The Dying Lands Chronicle #1). The scene of a guy retrieving the pearl! Oh my god that guy is my favorite fisherman ever! Altar of Influence follows Thannuel through early teens into manhood. But don’t let that put you off even in the beginning there is a lot of action. This story is about Sacrifice at its heart, and it found a place in mine. It also filled in some of the world building that was never explained in CoR. There are still tons of questions I have mostly about the Big Bad of the world called the Ancient Dark. 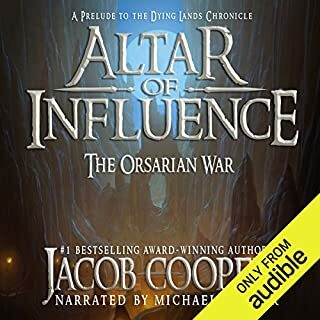 I thoroughly enjoyed Altar of Influence I really can’t wait until Circle of Reign is rereleased. It has been well over a year since I listened to COR. I thought it was great, especially good for a first time author. But it has been gone over and changed quite a bit I hear with help from David Farland and it will be rereleased soon. Jacob told me the other day that Michael Kramer started recording it on November 1st. So definitely keep your eyes open for that one. As for Altar of Influence I give it 4.50 out of 5 stars This is one series you should read now. If for no other reason than so you can tell your grandkids that you have been reading that series since it came out. I had been hearing good things about this series for a while and really wanting to read it. So instead of patiently waiting till it was on top of my "to be read' pile I pushed the pile over and grabbed it. So glad I did But now I will be even further behind on my stack as ill push everything else out of the way Again when the next book gets here. 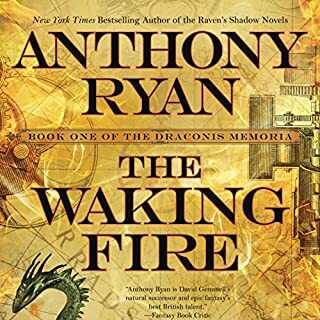 For a Novel as broad of scope as this it took me a remarkably short amount of time to understand the world building, but at the same time it was not generic fantasy tropes at all. and that is something to be treasured. Good dialog and pacing of the story was just about perfect. Over all I highly recommend this! Nick did a great job on the narration. And this great series was wrapped up well. I really enjoyed this book. It was nothing like I have read before. Most of the characters felt like real people. On the negative side the narrator doesn't change his voice at all for different characters so in a dialogue with more then two people it gets confused who says what.